CATERSON (Castlederg) Jude, peacefully at Silverdale Care Home, Castlederg, December 2, 2018 R.I.P. Beloved husband of the late Mary, much loved father of Margaret Rose (McVey), Mary (Oates), Robbie, Jude, Brenda (McConn), Michael and the late Carol Patricia. Funeral from his late home on Wednesday December 5th at 9.20am for Requiem Mass at 10.00am in St Patrick's Church, Castlederg. Interment afterwards in the adjoining churchyard. 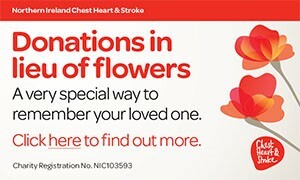 Donations in lieu of flowers please to Silverdale Care Home, Castlederg, c/o any family member. Deeply regretted and sadly missed by his sorrowing daughters, sons, sons-in-law, daughters-in-law, grandchildren, great grandchildren and entire family circle. I am sorry to tell you that Jude CATERSON has passed away.